I’ve been an REI member for close to 20 years, and the majority of the gear I’ve purchased during that time has come from them. Tents, sleeping bags, backpacks, stuff sacks, clothes… you name it and I’ve gotten it there. Physical stores, a wide selection, a good member program, and a great return policy… all reasons I’ve always tried to shop there before looking elsewhere. And despite what I’m about to say, there are still plenty of reasons to shop there. That being said, I’ve found myself gravitating more and more to products that REI doesn’t carry. While brands like Big Agnes, Gregory, Osprey, Mountain Hardwear, Arc’Teryx, etc. still make fantastic products, a lot of what REI carries is not on the cutting edge of backpacking-specific gear. You’ll still find gear there that’s absolutely serviceable for this pursuit, but there are a growing number of options that are better. The following, by no means, is meant to be a comprehensive list of quality brands you won’t find at REI. I’m also not an expert on the history of these companies, so I won’t presume that my views necessarily reflect the reality of who-came-first or who-did-what-first (several of these companies make similar products). I’ve had first-hand experience with some of the products/companies discussed, but not all. Some are included simply because I find them interesting or might be keeping them in the back of my mind for a future purchase. Of course, after all that talk about “brands you won’t find at REI”, Granite Gear is one that you actually will. The problem is that you won’t find very much on display. At the time of writing, none of their packs currently show as being in stock at any of their retail stores (I’m excluding day packs and accessory pouches from this statement because I didn’t look up every single one). When I purchased a Leopard AC 58 pack in early 2014 I did get it from REI… but there was only one (sized regular) in the entire country and it shipped from another store. Even then, I think it was probably an online purchase that was returned to the store and buried for a while. While their packs are typically a little heavier than what’s considered UL gear, I still think they’re fantastic and easily rival (and, in my opinion, surpass) Osprey when it comes to comfort and they’re far lighter than most Gregory packs. One of the deciding factors for me was that the hip belt / shoulder straps actually have padding, whereas a lot of UL packs sacrifice this and use basic webbing instead. Granted, many will argue that if you pack light you don’t need the padding, but it makes the pack more versatile. I think the Granite Gear packs (especially the Blaze AC 60) strike the perfect balance between traditional and minimalist packs. If you’re already in UL territory you probably won’t seek one out, but I simply don’t understand why REI doesn’t promote them alongside Osprey, Gregory, Kelty, Deuter, etc. I think they give the traditional packs a serious run for their money. The 2nd (and last) company on the list that you will find (in very small quantities) at REI. I’ve heard people refer to them as the “Arc’Teryx of Europe” (they’re based in the UK), and I think that’s partially accurate. They both market more on the mountaineering/expedition side of things and have crossed over into backpacking as well. Both have premium technical outerwear (shells, insulated jackets, fleece, etc) but they diverge slightly in the rest of their product line… where Arc’Teryx has climbing harnesses, backpacks, and shoes, Rab has sleeping bags and shelters. While their puffy jackets are what seem to cross over into the backpacking world most frequently (at least in the US), I sought out their MeCo base layers. A 65/35 blend of merino wool and polyester, this line blows the competition out of the water. What’s frustrating about the fact that REI doesn’t carry them is that there’s really nothing else on the market that’s quite the same right now. It’s not like other merino or synthetic options where multiple manufacturers are making the same things (SmartWool, Icebreaker, Ibex, etc.). Rab has really cornered the market here. I also picked up the women’s Xiom rain jacket for my girlfriend (on clearance at the REI-Outlet site, oddly enough) because it was one of the only jackets I could find that met the criteria I had: 3 Layer, pit zips, under 14oz but more durable than typical UL jackets, and under $200 (technically the Xiom lists for $250 but I got it for 30% off… score!) Generally speaking, though, most of their products aren’t available at REI. Sadly, anything I say about GoLite will be mostly irrelevant since they went out of business. They made some cool packs and shelters over the years and definitely helped pave the way for the cottage companies we see today. The only thing I ever bought from them was their race visor (actually, a couple of them, on clearance) which is basically a headsweats visor anyway. But, it says “GoLite” on it, so that means it’s a collectors item now, right? Update 06/25/15 – Strangely, months after I wrote this, and clearly after they went out of business, I found the Rush series of hydration packs on REI’s outlet site. Since I was already looking for a new day pack and they were 30% off, I picked up the 14L version. Talk about a bizarre shopping experience. Like Rab, Montbell is another well-established company that seems to have a larger footprint overseas than it does in the US (they’re based in Japan). While they have a full range of products on their website (backpacks, sleeping bags and pads, trekking poles, cookware, etc. ), I sense that their niche is picking up where GoLite left off with UL outerwear. Justin Lichter has been seen sporting their stuff for a while, and their name is becoming more prevalent on discussion forums and in online reviews. I use their Tachyon wind jacket and Versalite rain pants (which I’ll discuss further in another article). They’re also one of the few companies I’ve seen that post the water resistance / breathability numbers in their product specs. ULA (Ultralight Adventure Equipment) is mostly known for their backpacks. I don’t have any personal experience with them and have never actually seen one close up, but I’ve always heard good things. If I had to start shopping for another backpack, I’m not necessarily sure I’d wind up with a ULA pack, but they would certainly make the list of contenders. Worth checking out if you’re in the market for a backpack. If there’s one type of gear I’ll probably never buy from REI again, it’s a shelter. While Big Agnes has finally come to market with a tent that uses trekking poles instead of traditional (dedicated) poles, it leaves a lot to be desired compared to what’s out there today. Sierra Designs recently came out with one too, and while it’s definitely more innovative than the Big Agnes Scout, I’m just not sure it can compete with what Henry Shires has been doing with TarpTent for years. The brilliant thing about TarpTent isn’t that they’re the lightest shelters on the market; it’s that they’re a perfect crossover between traditional tents and minimalist shelters. Take the Notch, for example, which I’ve been using for about a year. For $285 you get a shelter that has some of the advantages of a tarp (the ability to set it up in the rain without getting the inside wet) but with the internal living quarters of a tent. The inner tent can be removed and the tarp can be used by itself, which, unlike traditional tents that tout a “fast pack” option (rain fly and footprint), is actually still useful in this configuration. When comparing this against the competition, which often sells these components separately (tarp and bug net), I think TarpTent comes out on top when it comes to price. Another thing I like about TarpTent is that their non-trekking pole shelters are designed with that purpose in mind rather than simply offering to sell you a substitute for a trekking pole. While this is probably less flexible than a shelter that can use either, it gives people who want a tent a good option vs. traditional tents. The Moment DW weighs slightly less than the Big Agnes Copper Spur UL1 (both are side-entry tents) but the Moment DW is $80 less and includes the aforementioned advantages of the Notch. While a lot of small companies are designing very minimalist, niche shelters, TarpTent has good in-between products. Some die-hards will gravitate more towards the companies I’ll mention next (and there’s nothing wrong with that), but I think TarpTent is a good option for “fully featured” lightweight shelters and they definitely have the best dedicated-pole shelters when compared to traditional tents. Lastly, Henry has always been extremely quick to respond to questions and orders are usually filled in a timely manner. My initial order shipped in 4 days (that includes 2 weekend days) and a subsequent order for the partial-solid inner tent shipped within 2 days. Highly recommended. MLD is another small company that has a strong reputation for making fantastic shelters. There’s no doubt that they’re on the minimalist side when viewed next to TarpTent, but I don’t think it’s really fair to compare them as they take different approaches. Where TarpTent develops crossover styles that have more similarities to tents than tarps, MLD has a much stronger focus on the “tarp” aspect. There are a handful of small, independent companies that have popped up in the last 10-15 years that have pushed the boundaries of what an ultralight shelter can be, and I think MLD has definitely contributed to this evolution. In addition to heavily promoting cuben fiber (as well as experimenting with other lightweight fabrics over the years), they’ve created several innovative tarp designs (like the TrailStar and Duomid) along with more traditional flat and catenary cut tarps. It speaks volumes about products when people like Andrew Skurka not only use them for ultra-long distance hikes, but continue to use them after they’ve been put through the wringer. I’ve read comments on multiple occasions stating that while some cottage companies can have quality control issues, MLD consistently delivers high quality products. They’re also receptive to customizations, so if you want more tie out points or a non-standard size tarp, there’s a good chance you’ll be able to get it. Unfortunately, there is a major downside to MLD: long wait times, inaccurate forecasts, and sparse communication. I purchased a bivy and a friend purchased a TrailStar, both cuben, at different times (almost a year apart). In both cases not only did the items arrive long after they were supposed to (on top of an already long wait), but attempts to get updated timelines were met with further inaccurate predictions. In the case of my bivy, which was forecast to be shipped 4 weeks from the order date (later updated to 4-6 weeks after I contacted them), I emailed during week 5 to get an update and was told that it would “go into production” the following week. When I emailed in the middle of the following week to see if it was expected to ship, I received an automatic reply stating that the company was on vacation that week. Note that the multiple requests for a ship date were due to the fact that MLD doesn’t send shipping notifications or tracking numbers, which can be a problem for people who live in a city and need to pay close attention to when their packages are expected to arrive. MLD has since updated their home page (although it changes fairly frequently, so I’m not sure how long it will say this) directing customers to their Info > Warranty page for a lengthy explanation of their shipping procedure, which is basically that they don’t insure or track packages and that they’re not responsible for lost items. They further go on to say that if you have issues with the mail where you are, you should contact them separately to arrange for a different shipping option. First of all, I’m not sure who would think to look under the “Warranty” section to find information on shipping; most people would just expect to find the shipping options where they place their order. Second, when I emailed MLD to check the status of the order, I specifically said that I have issues with the mail in my area and there was no offer for an alternative shipping method even though my item hadn’t shipped yet. In fact, it didn’t ship for another 3 weeks after that, so if they were willing to offer another shipping option (which I would have gladly paid for) they had plenty of time to do it. To be clear, I don’t have a problem waiting for a superior product, but I do have a problem when the wait is consistently much longer than what is advertised. It’s one thing to get a sudden influx of orders and fall behind for a short time, but having inaccurate forecasts for over a year seems to indicate a systemic flaw rather than an isolated problem. Add to that the fairly negligent oversight of telling someone that their order would be ready when in fact they were going on vacation instead, and you wind up with a frustrating experience regardless of how good the product is. I truly hope this gets resolved because I do think MLD makes fantastic products. In fact, once you have whatever you ordered, you’ll likely forget about the fact that what you went through to get it was a pain. I stand by their products, but I would exercise caution when ordering anything that you need in the next 3 months, regardless of what their homepage says. Strangely, I came across Six Moon Designs years before I actually ended up with a non-traditional shelter. I just landed on their site one day and they stayed in the back of my mind as a company that had really cool ideas. When I started shopping for a trekking pole supported shelter I remembered their name and added them to the list. 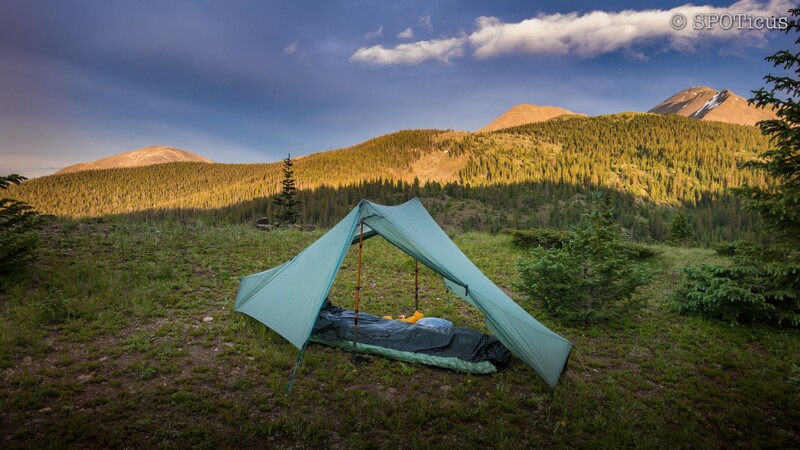 A short, if oversimplified, description of their products would be a cross between TarpTent and MLD, where they have some shelters that are more integrated (i.e. tarp w/ interior floor/netting) while offering full-coverage tarps and cuben options as well. If I remember correctly, one of the reasons I didn’t end up with one of their shelters was because the “tents” didn’t have removable inners, and in order to get that functionality I would have had to purchase a tarp and a net tent separately (costing more than the TarpTent Notch, which had that functionality built into one product). Still, it seems like they make good products and I would go back to them in the future if I had the need. One of the limitations of TarpTent is that they don’t make any cuben shelters. They’ve knowingly addressed this in the FAQ on their site, and I can’t blame them for their position. But, if you had the desire to find something similar to the Notch in cuben fiber, you might check out ZPacks. I have no experience with them personally but they seem to be on the rise and creating direct competition with TarpTent and MLD. These guys are also way more into cuben than anyone else, offering not only all of their shelters in it but even their backpacks as well. I’m a little skeptical about the durability of a cuben backpack, and I’ve read a few reviews that have said that they do not hold up for an entire thru-hike (thinking about the 2,000+ mile trails here), but it is a novel idea and I’m sure it can be useful in certain conditions. They sell an array of other miscellaneous gear as well, like sleeping quilts and UL rain gear.